Op de landkaart van Afrika lijkt het een plas, maar het is groter dan de Noordzee en het heeft een Westerse naam: Victoriameer. Langs de oostkust is dit meer bezaaid met kleine eilandjes waarop eenvoudige vissers wonen. Ooit is op een van die eilandjes een witte man aan komen roeien, geheel gehuld in kleren, om er de zegeningen van de Westerse wereld te brengen; wat hij heeft achtergelaten was een trompet. 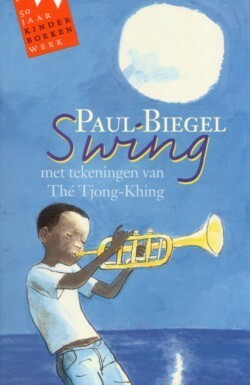 Daar komen de vissers niet op spelen, tot het instrument in handen kwam van een kleine jongen – en dat is het begin van het wonderlijke avonturenverhaal dan in dit boekje staat geschreven. On the map of Africa it only looks like a puddle, but it’s larger than the North Sea and has a Western name: Victoria Lake. Along the east coast, this lake is dotted with small islands where simple fishermen live. Once upon a time, a white man – completely dressed – rowed to one of the islands to bring the blessings of the Western world; what he left behind was a trumpet. The fishermen didn’t know how to play it, until it fell into the hands of a little boy – and that’s the start to the wondrous adventure that’s described in this book. The first thing I noticed about this book were the absolutely gorgeous drawings in it. The ones in the book are in black and white, but a separate booklet has been added with the same pictures in color! The story itself wasn’t the best; the adventures of the boy and his friend are funny and cute to read. However, they aren’t interwoven very well. It all felt like separate stories to me. The characters seemed different almost every time. They only had one thing in common from story to story; the boy wanted to play his trumpet and his friend wanted to try and get him to go home. What I do like however, is that the story is set in Africa and that by default (and it’s mentioned in the book as well) black is the norm; black people are everywhere. The further they go down the Nile however, the more other people they encounter. Another aspect I enjoyed about the book is that it’s about music; in particular about making music. I’ve not read a lot of stories that focused on that.